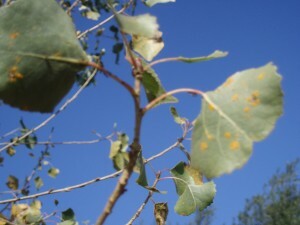 On a recent warm fall day, bees buzzing around a native cottonwood tree captured my curiosity. Squinting up through the dwindling leaves of the ten- or twelve-foot tree, I could see that the bees didn’t look as if they were entering or exiting any hive. Quietly, I stepped closer to investigate. Small yellow-orange pockets clung to the leaves’ undersides. The bees appeared to gather the substance. Do cottonwoods release pollen through their leaves? I wondered. I’d never heard of such a thing, but the bees’ action puzzled me. They hovered about, collecting the substance into thick saddlebag shapes on their hind legs. Excited and intrigued, I later discovered through research that the substance is a fungus, melampsora, which infects cottonwoods and some other trees. As it turns out, honeybees collect the fungus, commonly called leaf rust, and take it back to their nests for ingestion same as they do pollen. Scientists have a number of theories for the behavior, ranging from wider nutritional needs to not enough flowers blooming close to the hive. Who knew bees enjoyed a varied diet? Bees have always fascinated me. Five or six years ago, feral bees began a hive in the hollow wall at one end of my property, and I welcomed them. A friend told me that, at a time when bee populations the world over suffer from the use of pesticides and habitat infringement, their arrival at my place must be a good omen. I liked that analysis. Nature provided my own little symbol of prosperity! The bees’ presence, though, has required some adjustment. My family has learned to work around them. We try to do any yard work near the hive in the early morning or in the last light of day to avoid their more active hours. When guests come to sit by our small pond with its natural-looking rock fountain, we warn them not to get too close. On sunny days, bees are always present at what has become their watering hole, and for the most part, we comfortably cohabitate. When you’re hiking our natural spaces in San Diego, watch for bees. The insects form new hives in the spring. On several occasions, I’ve been fortunate enough to see this activity. Once, trekking over the rise of a hill on a clear spring day, I first heard a low roar then looked up to spot a black cloud of bees. I ducked, the swarm whizzed over my head, and I pivoted to watch them fade into the distance. At other times and other places, I’ve been fortunate to see bee masses cluster around the landed queen. I’ve never been stung by a bee while hiking . 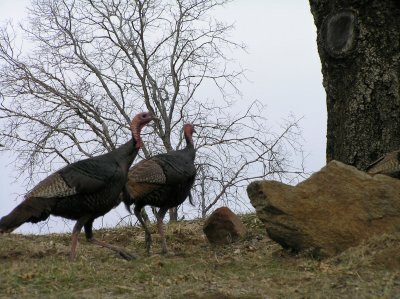 . . only in my own yard! In the future, I hope to learn more about beekeeping and perhaps harvest honey from some cultivated hives. For now, I respect and marvel at these insects that are so vital to pollinate our food and flowers. Their industrious presence enriches my world. Special comments: Desert temperatures can be extreme-suggest fall, winter and early spring hikes. Dress in layers and bring lots of water. Not recommended for children. paradise for those in good physical condition. Take Interstate 15 North to the Pala/76 exit and drive east for 33.6 miles to Highway 79. Turn left, traveling 4.1 miles to S2, where you’ll turn right and drive another 4.6 miles to Montezuma Valley Road (commonly called the &quot;Montezuma Highway&quot;). Turn left. Drive approximately 14 miles to the trailhead on the left, which sits about a mile above the Visitor Center. 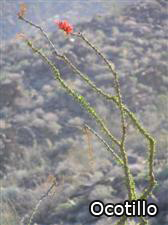 present, <b>Ocotillo</b> reaches heavenward with its spiny arms bedecked with lipstick red blooms. Less than a mile in, you’ ll come to a split in the trail. Head left (the right-hand route will take you to Maidenhair Falls), and the trail narrows, beginning its zigzagging ascent. Steady climbing becomes a constant, up through boulder outcroppings baked brown by the desert sun and heat. In the early mornings, and later on cold winter days, the fog-filled valleys open in the distance, giving an otherworldly feel to the hike. 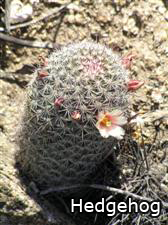 As the trail’s elevation rises, the ocotillo plants thin, leaving <b>Hedgehog</b> and cholla cacti as surrounding mainstays. Some cactus varieties are short and stout. Others are taller and lined in protective spines the size of toothpicks (be careful). With your mind free of citified clutter and stress, let your imagination go, finding animals and <b>other shapes</b> within the cactus and rock formations – – -nature likes to have fun, and so should you! also see bobcat tracks (or perhaps get a glimpse of one of the cats, more likely in early morning or evening hours). Low-flying quail skitter by in large groups startled by your presence. On a recent hike, a kangaroo rat hopped off, its furry hind feet and bushy tail a flashing glimpse among the rockscape. difficult to follow from the valley up; although people starting near Pena Springs to head downward often report difficulty in locating the descending route. Roadrunners hop among the rocks, their long tail feathers flicking up and down, balance ballasts for their quick movement up the rocks. The short viewpoint trail to the Culp Valley Overlook comes as a surprise when you finally reach it. Marked by a sign on the left and with a yellow-topped California Riding &amp; Hiking Trail pole on the right, you can’t miss it. There is no denying that the view is spectacular, but having enjoyed the approximate six-mile journey through desolate landscape that allows one to escape civilization, the overlook can be anti-climactic. The Pena Springs pullout, which leads just half a mile from Montezuma Highway up to the overlook, is often busy, urging hikers who’ve spent the last three or four hours with quiet, nature-nurtured thoughts to head back down the mountain and its solitude. Be sure to enjoy views of the valley as you descend. The hike up might have logically seemed the more difficult trek – – – but your body may tell you otherwise at the end of the day. Descending on the sometimes steep narrow trail lined with cacti means putting on the brakes, and in gusty desert winds, requires attention to every step. Your lower legs, tendons, and toes may backtalk later. The concentration needed to navigate the downward trail also tires the mind. Once at home, a hot soak and a fluffy pillow pave the way to a good night’s sleep – – – dreaming of your next visit to the Anza Borrego Desert State Park. 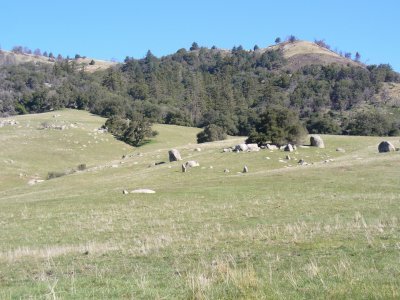 Special comments: Within the more than 400 acres of protected land are endangered California habitats including native grasslands, Engelmann oak woodland and coastal sage scrub. Please show respect to the environment and the people behind preservation sites such as historical Wright’s Field. 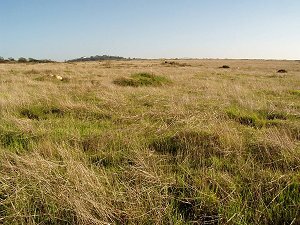 An easy trail meanders along through native grasslands that shift in the wind like ocean waves. Take Interstate 8 to the Tavern Road exit in Alpine and turn right (south). Drive for approximately one mile before coming to Joan McQueen Middle School at 2001 Tavern Road. Park close to the school, on Tavern Road, and walk east, up the narrow road on the north side of the school to get to the trailhead. Near the trailhead, several small Engelmann Oaks planted by middle school students will someday offer cool shade and a habitat for birds and insects. For now, the spindly trees mark the starting point as the route cuts southeast, across Wright’s Field. Look closely in the grass alongside the trail. 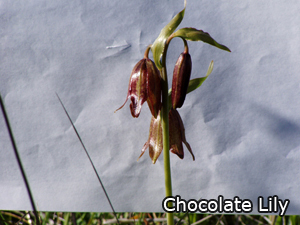 You may be lucky and spot the rare Chocolate Lily blooming among the tangle of grasses. The nodding brown bonnet exteriors hide a green and purple interior, and grow on short green stalks. Please don’t pick this scarce California native bulb species that’s threatened by San Diego’s continued urban development. The bulbs are slow to mature, and won’t survive transplanting from the wild anyway. If you find yourself enchanted by the satiny brown lilies (sometimes called &quot;Chocolate Bells,&quot;), find domesticated varieties in garden stores that carry rare bulbs. southeast), and at approximately 0.6 miles, reaches a junction with another path. Go to the right, southwest toward nearby homes, then bearing even more right (west). Continue up the hill, leaving the grasslands behind as you head into the chaparral. At the top, share the &quot;king of the hill&quot; spot with congregating red ants, busy at work near their anthill while the buzz of hummingbirds fills the air. Head down the hill via a rutted trail to the left, heading north. 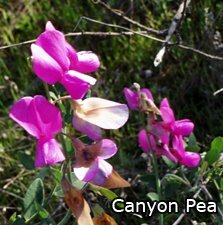 Be on the lookout for splashes of bright pink in the spring as the Canyon Pea twines its way around the scrub. The perennial blooms in clusters of the vibrant light and dark pink flowers. The path grows steep, moving quickly downhill past mature lemonadeberry bushes then gradually northeast back across the grasslands. Watch for birds overhead such as the red-tailed hawk, which is fairly common. Even the Golden Eagle is said to make this area its home. When you reach the entry trail, head left if you’re ready to go, and retrace your steps back toward the corner of the school and out. Or, for a little more hiking, continue north toward towering Eucalyptus trees standing a short distance ahead. Birds twitter from high among the branches. Just past these trees, a trail leads to the right passing through stands of Engelmann oaks then cuts to the right (southwest) again, back to the main trail and out. Driving the opposite way on Tavern Road, stop at the Alpine Creek Shopping Center which is just short of reaching your return route of Interstate 8. There, you’ll find The Bread Basket Bakery and Restaurant (1347 Tavern Road, Suite 22), featuring a casual atmosphere, home style country food, and scrumptious baked goods that might not make it the road trip home. Call (619) 445-0706 for more information. As the trail’s elevation rises, the ocotillo plants thin, leaving Hedgehog and cholla cacti as surrounding mainstays. Some cactus varieties are short and stout. Others are taller and lined in protective spines the size of toothpicks (be careful). With your mind free of citified clutter and stress, let your imagination go, finding animals and other shapes within the cactus and rock formations – – – nature likes to have fun, and so should you! Past the wash, continue climbing. Wide steps of flat ground and trail offer restful meanderings between gains in elevation as you hike along. Towering boulder groupings on either side of the route all begin to look alike as you head continually upward. Don’t search for trail markers, which become virtually non-existent past about two miles. 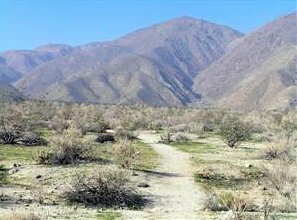 The trail, however, isn’t difficult to follow from the valley up; although people starting near Pena Springs to head downward often report difficulty in locating the descending route. Roadrunners hop among the rocks, their long tail feathers flicking up and down, balance ballasts for their quick movement up the rocks.